new person: So what brought you to Seattle? Kyle: I got a job at a small biotech start-up. new person: Oh, wow! That’s great. And what do you do? me: I’m self-employed. I’m starting a business teaching graduate students about personal finance. After we had the above exchange half a dozen times, I realized that our career choices do sound risky to an outsider and are in reality quite risky. There is a real possibility that both these businesses will fail – even simultaneously! Kyle and I are naturally both risk-averse people, so it doesn’t fit with our personalities that we would both become involved with entrepreneurial activities, particularly at the same time. In fact, while we were in graduate school and we discussed Kyle joining a start-up, it was always with the assumption that I would have a stable non-research position so that our household income would be diversified. We came to these career choices largely by circumstance – Kyle wasn’t targeting working at a start-up, but this job is just an amazing fit with his research interests, and I wanted a ‘job’ I could take with me through our move and to pursue the weird passion for personal finance that I developed during graduate school. But I think there is a clear reason why we feel comfortable with these choices: We built a financial safety net for ourselves during graduate school and diversified our income. It would have been easy to let ourselves off the hook for saving during grad school. Combine the low expectations of any American starting to save in their 20s (YOLO!) with the fact that we were each only earning about $25-30,000 per year, add in a dash of the permanent income hypothesis, and we could have justified coming out of graduate school with the same net worth as we had going in. And had we done that, we probably would both be in the jobs we imagined for ourselves a couple years ago: a postdoc for Kyle and a stable ‘alternative career’ job for me. Instead, during graduate school we pushed ourselves to save both for retirement and short-term expenses. We gradually increased our retirement savings rate from 10% at the start of grad school to 17.5% by the end, flying past 1 year’s salary in our Roth IRAs by age 28. Including our short-term savings, which we amassed almost without awareness through automatic transfers to our targeted savings accounts, we surpassed a net worth of $100,000 just before we graduated. I believe that getting an early start on our retirement savings and creating a large cash cushion during graduate school enabled us to make our risky career decisions, which in time may even bring us a monetary upside. We have also limited the potential downside of losing our jobs through (potential and actual) income diversification. 1) We can make risky decisions. While Kyle’s start-up going under or my business never getting off the ground would definitely stink overall, it’s frankly not a concern of ours financially. We have the ability to find other jobs, of course, and the savings and sources of income to fund our living expenses for even a protracted job search process. Right now, thanks to Kyle’s higher income and our long experience with keeping our living expenses low, we will be able to live on Kyle’s income alone. When Kyle was considering taking this job, we of course talked over what we would do if the start-up went under with no warning (we think it’s unlikely, but…): Kyle would look for his next job in southern California and we would live on our savings and my lower income until he landed one. Our existing short-term savings are the key to making us feel confident enough about this back-up plan for him to take the job. Risk-averse people like us would not consider going into debt to fund our living expenses during a job transition, so without the savings in place he honestly probably would have ended up in a (more secure) postdoc position. By living on Kyle’s income alone right now, we are thus avoiding the two-income trap. (Briefly: Many middle-class families often need both spouses to have income to meet their living expenses, which throws them into a tailspin when one loses a job.) As my income is not needed for paying our living expenses, any income I do bring in is just added security (or fun) for our life. If Kyle were to lose his job, we could depend on my income from my business and my contracting job or I could get a ‘real’ job. The contracting job is my fall-back plan for dependable income in a pinch, and I’m trying to build diversified income streams even just within my business (active: speaking, writing; passive: digital products). 2) We might enjoy an upside. Entrepreneurs love to talk about how there is no limit to your income – and in the same breath tell you that it takes years to earn anything substantial. I’m definitely on the latter side of that equation now, but again there is the possibility of the former in time. More realistically than sky-high income, though, is the upside that again I am already experiencing: job satisfaction. I love working all alone from home (yes, I wear pajamas half the day), I love my subject matter, I love my audience, and I love my medium(s)! This benefit to building savings and diversifying income is not one I really thought about while I was in grad school. I mean, I realized that savings would give me security and options, but I never thought it would enable us to take these kinds of career risks right out of the gate. This might end up as one of the stronger arguments I know for why to start saving during grad school! Has your savings given you options? Do you wish you saved more or less in the past? 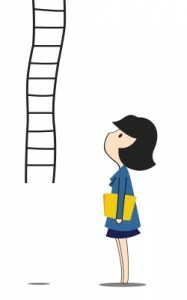 Have you ever taken a big career risk (or two)? 27 Responses to "What We Did in Graduate School to Enable Our Risky Career Decisions"
Our grad school frugality and savings made us feel like we could manage having a kid even on one postdoc income. But that risk basically means we can’t do much career-risk wise for a while, especially with the high cost of childcare. Working for the man here! I don’t actually see working at a start-up for a good salary as risky though, especially compared to a postdoc (or working at a startup for equity rather than cash). People don’t stay in jobs for 30 years anymore, even at big companies. If Kyle gets 2-3 good years out of this job and banks the higher salary, he will be in a great position to move on. If he had a postdoc, he would HAVE to move on in about that time frame even if he wanted to stay, he will have made half the money, and he will have trained for a very specific and high-risk career path (the academic job market!). Of course starting your own business is risky, but Kyle’s seems pretty solid in comparison to the alternative! A startup job is risky in that a startup pays you salary plus equity and a big company would pay you salary plus bonuses and better benefits. If the startup takes off, then they could end up being equal, but otherwise, the big company path is going to come out ahead. It’s also risky in that the company can go under without too much warning! For us in particular though, Kyle didn’t have a job offer from a large company (yet) when he made the decision to go to the start-up. So we weren’t comparing various types of industry jobs with one another, just industry vs. a postdoc. That actually is not what I meant in terms of comparing to risk in academia! Once you have tenure there is basically no risk, but the number of people who get Ph.Ds. vs. the number who wind up in tenure track jobs shows that even trying to get one is very risky. Postdocs, short term lectureships, and adjuncting “on the way” to the tenure track are all inherently riskier AND less financially healthy than private sector jobs because private sector jobs don’t have a definite end date. You CAN get fired or laid off in the private sector, but that’s different than knowing you’re only employed for two years in a postdoc, or having no benefits as an adjunct. I wasn’t even thinking in terms of bonuses vs. equity because honestly, all of my non-academic work experience has been in settings where you don’t get either! Not to mention you’re eligible for unemployment when laid off from working for an employer in the private sector. Not so much when a short-term contract runs out or you’re fired for cause at one of your reviews. Hm, I view those jobs a bit differently than you do, but maybe that is because neither Kyle nor I intended to get on the tenure track. So my view of security/risk was more about the position ending sooner than expected, which we didn’t perceive that this particular one would. But definitely private sector jobs are better for your bank accounts. I told Kyle he gets to be laid off for one year for every year he has this job, because of earning so much more than in a postdoc. Great example! Essentially, savings give you options. I think a lot of grad students think it will be simple/easy to afford a child post-grad school and they don’t need to prepare, but it really isn’t the case. Non-grad students make tough financial choices around family planning, too! 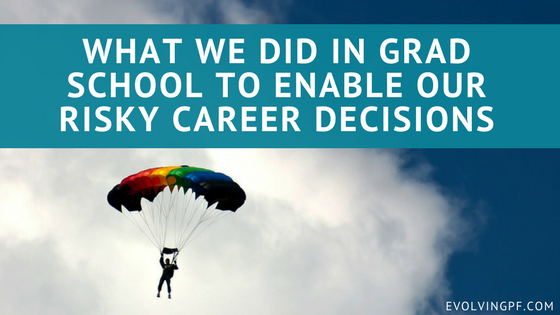 We viewed his job options as all risky in different ways, really. The postdoc would have been a VERY stable salary (the lab was ridiculously well-funded) for about 4 years. But the higher income in the private sector sort of buys you time for job searching without a job, in comparison with a postdoc. I mean, Kyle can (not accounting for taxes) work for 1 year at his current job and earn what would take him 2 years at the postdoc. So we can afford – both in terms of our existing savings and our ability to save now – time off in between jobs in a way the postdoc wouldn’t allow. Haha I think this is one thing my fellow grad students don’t seem to get. Whenver the concept of saving money comes up, they say oh yeah I’ll start saving when I get a real job. But life only gets harder from here. There will almost always be an excuse not to save. Oh I want to buy a house. Oh I want to have a kid. Oh my spouse wants to take a risky job…etc. It’s much easier to build your saving habits when life is simpler. Yes, I kind of have a “show me” attitude with respect to habits. I don’t believe people will start saving after grad school automatically if they weren’t doing it during – same with giving, tracking spending, and lots of other areas of money/life. It is certainly possible, but it takes discipline. As you said, when you leave grad school you kind of shed one obstacle to saving (low salary) but uncover several new ones (wanting more for your life like a family, house, new city, etc.). Our graduate school savings allowed me to take a job and us to buy a house without my husband having one lined up (he got one), and our later savings/frugality allowed him to quit the TT job he got without having another job lined up when he didn’t want to do it anymore and he had the luxury of waiting to find a job he really wanted rather than one that would pay the bills. Awesome example! What positive choices! Emily, I wish I had been more serious with regard to finances. Thinking of those many years lost, it makes me feel regretful. If I had managed my money more wisely, I could achieve more of my goals and retire earlier than expected. But, I gotta accept this fact as well learn and move on so that I can keep up with my goals. You can’t change the past, but there’s no time like the present to take steps toward what is truly important to you. Good for you! Hm, I hadn’t thought about that. I guess it really depends on your view of children. They are certainly a no-going-back kind of decision, unlike career choices. But I bet there are lot of 40- and 50-something parents who appreciate their freedom in a whole new way after packing their kids off to college and can explore options again at that life stage. I’m so glad to hear that your lifestyle freedom is thrilling to you! Our savings has absolutely given us options! Without it we wouldn’t have been able to travel, or change our plans on a whim quite like we have since I graduated last year… But I think there are two benefits to having a healthy savings habit; the first being the obvious that you have money to do things, but the second is the minimization of expenses because you aren’t using your full income that also provides more options! For us, knowing how little we can live off of will allow both my husband and I to take leave for a year when our baby is born. The number of conversations we’ve had with German friends (who would probably benefit more from the parental leave than we will! We haven’t been living here and earning money for long enough…) who have said they would love to do the same but can’t afford to is astonishing. Great point about lower your cost of living simultaneously with saving. Yours is such an incredible story of the power of saving! Thank you! I’m definitely investing my time, though not much money (directly) right now thankfully. The savings are definitely helping us weather my low income! We are now in a position to take more risks, but because we didn’t do a good job in our younger years, it has taken until our 40’s to get there. If I could go back, I would have done a much better job of being mindful of savings and spending while in school and after graduation. Better late than never! And the risks you have been able to take have benefitted your family so much! Some may call it “risky” but it sounds like you have planned for your career track. I think by saving and being prudent in researching your decisions you have managed to limit much of the risk that others may perceive. Well, we weren’t planning for this choice exactly – but we were prepared for whatever came our way, apparently!